Wout Van Aert 3X Champ! MVDP Undone in Heavy Mud! 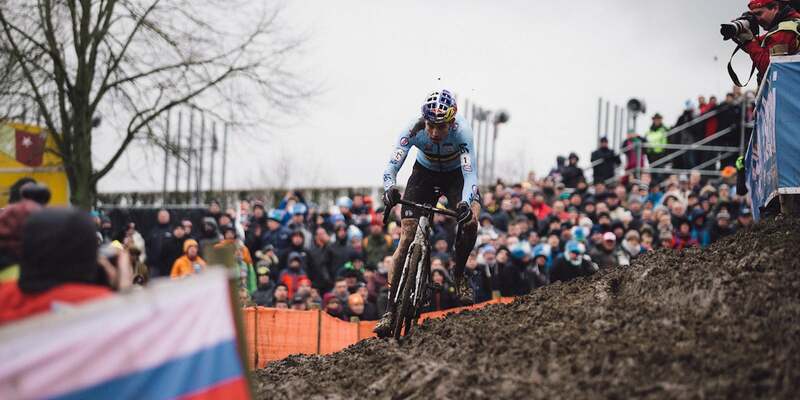 The Belgian, Wout Van Aert, won his third consecutive Elite World Cyclocross Championship, riding the muddy Limburg course with apparent ease. The same could not be said for Dutch pre-race favorite, Mathieu Van Der Poel, who struggled from lap one and was quickly distanced by Van Aert, and eventually caught by Belgian Michael Vanthourenhout. It capped an incredible weekend for the Belgian team that included the Women’s Elite win with Sanne Cant and the U23 win with Eli Iserbyt. Stephen Hyde was the top American, almost seven minutes down. Enjoy these images of day two at #Limburg2018 from Balint Hamvas. The U23 race was another race that did not go as planned. The duel between Brit, Thomas Pidcock and Belgian, Eli Iserbyt, did not materialize as Iserbyt rode away from a struggling Pidcock, who managed only 15th. Joris Nieuwenhuis of the Netherlands was second while France’s Yan Gras was third.